This truly is an amazing sword. A few minor issues though is that it is difficult sometimes to retrieve it from the sheath, and the cord wrapping the blade will separate easily and extremely if not held correctly. Other than that though, it is an awesome piece. Bad a** design, light weight, sharp on the point, but not to sharp along the blade, nothing a simple sharpener can't fix though. I've been making plenty of clean cuts through cardboard, fruit, ect. Very well made sword overall. Great blade, awesome details, strong grip handle and great serration on blade. Must have for collector or just a conversation piece. This blade is really good and very well made the tip is very sharp and the blade itself isn't that sharp but its good enough and its very light and its a bit hard to take the blade out of the sheath but other than that its a very good sword. I ordered this sword buy one get one free. When they arrived, one of them had a crappy handle wrap. The swords are a bit shorter than I would have liked, and the handle wraps and sheath are god-awful, but overall I do like this sword. It is light, it looks bad-epic, and I could kill someone with it. Could do with a bit of sharpening, but that seems to always be the case. Bought two gave one to my son he loved it. Light weight nice feel in your hand. Sheath is ok a little hard to pull out. But mine will on my wall. Usable if needed. I bout this sword about 4 months ago .I was a little mad that it did not have belt loop but I fixed it by sowing it down . To end this review this sword is great so I bid you good bye. this item was neat,it was sharp and light weight,a little hard to pull from the sheath but well worth the money. First I got My shipment in THREE Days! W2G BUDK. 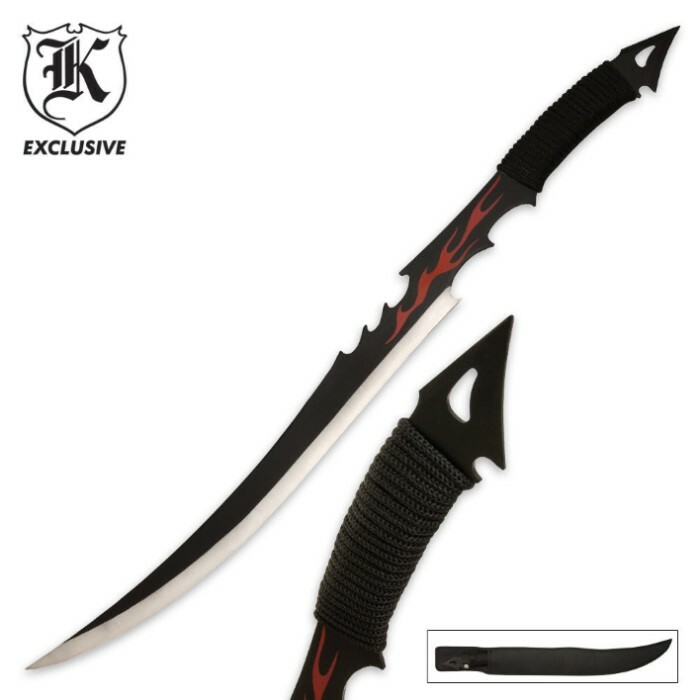 This sword is sharp not razor sharp but excellent for the price. Battle ready Yes! The tip and the blade is deadly for sure. This sword has a bonus on the handle a spear like tip not sharpened but could be if you do You need to make a cap sheath for it! The handle is nice for someone with small hands ( young adult & female survivalist). I need more thickness in the handle for my big hands so I'm going to Wrap it with more paracord for better grip for my taste.If the blade was longer by 4 inches , made from thicker stainless steel & wider blade I would give it another 5 stars to equal 10 stars! the Nylon sheath is made very well but I can see this deadly weapon could cut threw it so I'm going to beef it up with some fiberglass resin hardener or maybe adding brass or metal eyelets to give it a custom look too the sheath & adding a brass or metal tip to the sheath because this deadly blade ( I do mean deadly Blade not a toy) is Dangerous. 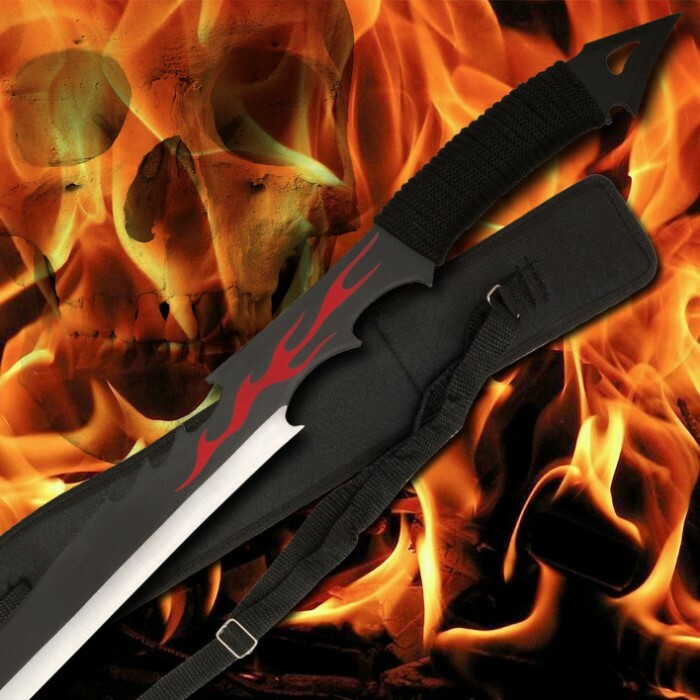 If you like the looks of this blade get it for the price you will love this sword . I am Thinking of buying another one . This is a one handed sword. Love this sword sooo much, had 2 have it again after the last one was stolen. Only thing about it is, u can't draw it quickly from the sheath. Besides that, totally awesome and wicked sharp! !